Heather Raffo and Mahira Kakkar in Wormholes For Sale At the Corner Bodega. Photo: New York Rep. Even within the parade of horrible events that has troubled the Arab World in the years since 2011, Yemen stands out for its starkness, its brutality, the ways in which it implicates the West. More catastrophically a humanitarian vacuum than Libya, more removed from the Western (and even Arab) imagination than Egypt, and more directly a proxy fight between outside powers than Syria, Yemen has endured over a period of seven years, every bad narrative of a region already overwrought with them, sustaining revolution, sectarianism, civil war, drone strikes, epidemic and now famine. Of course, the very notion that a broad analytical frame can be applied to a region stretching from the Gulf to the Atlantic and deep into the Sahara is one that must be challenged and denied at every opportunity. But Yemen, historically the poorest of the Arab countries, with a rich oral tradition but a nascent literary and theatrical one, carries a far more urgent call to the stage than to simply challenge the Western eye. It asks for engagement, to be known for the basic fact of its existence, and to be salvaged before it disintegrates into dust, bones, and ruin. Imagine: Yemen, a benefit reading of nine short plays presented June 28, 2018 by NewYorkRep, Theatre Three Collaborative, from directors Kevin Hourigan, Naomi Wallace, and Kia Corthron, offers an unflinching, if at times flickering, portrayal of the very urgency of this call, as well as the failure of language to convey how precipitously close to disintegration Yemen already is. At ten minutes a piece, authored by playwrights writing from within, beyond, and adjacent to the conflict, these plays are effectively extended scenes, seldom with more than two performers, each an exercise in which the audience might locate the conflict, depending on where they stand in relation to it. The first performance of the evening, Ismail Khalidi’s Push/Pull, locates the conflict within the increasingly visible diasporic community of Yemenis in the United States. Directed by Markus Potter, Push/Pull is a back and forth dialogue over a breaking long-distance line between Issam (Bhavesh Patel), a Yemeni-American bodega clerk (in either Brooklyn, Detroit, Chicago or San Francisco, per stage notes) and his sister Saba (Leta Renee-Alan), an emergency room physician in Sana’a. Saba recounts her day picking shrapnel from the intestinal track of a small child, while Issam chides his customers for opening the door the wrong way. Leta Renee-Alan in Push/Pull. Photo Credit: New York Rep. They recount a childhood firmly anchored in America and Yemen, in Detroit Tigers home games and Ninja Turtle action figures. The how and the why of what they’re now doing on opposite ends of the globe is less important than the struggle to stay connected in vastly different places that contain different meanings in the context of power. In the face of American indifference, Saba asks her brother, “You let ‘em know what’s up,” before the stage goes dark again, in one of several power outages that take place throughout the piece. Issam is helpless to do anything about it, except look at his iPhone, waiting for the connection to return. But for whatever the absurdities visited on language in Push/Pull, it is works such as T.D. Mitchell’s Atonal, and Mashuq Mushtaq Deen’s Of Ruin, that occupy a more identifiably Godot-like space of doomed resignation, where one waits less for the light to return than the end of any pretense that it ever will. In these spaces, the conflict is less a problem to be rectified, than a condition from which nothing, not even memory, can be redeemed. 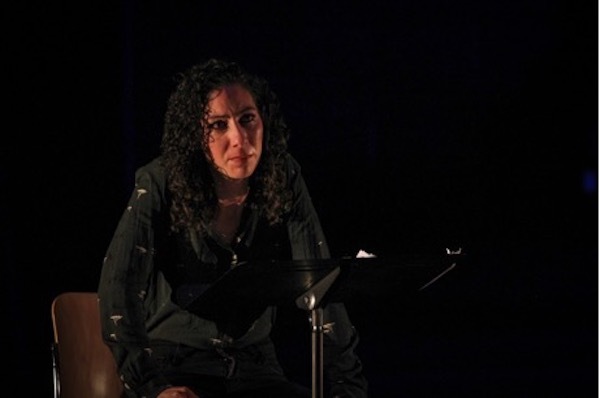 Directed by Lucie Tiberghien, Atonal features two women (named One and Two, in a recognizably Beckettesque pairing, and performed by Jill Eikenberry and Ellen Parker, respectively) imagining their way through the dark to the other side of conflict. “I’m tired, and that seems reactionary,” One laments, to which Two replies, “You can make terror work for you. You can vacuum.” Between blackouts, between air strikes, they await intervention, in any form, whether from the U.N., viral video, opioids, any modern remedy available to relieve the burden of contemporary warfare capitalism. But despite its title, Atonal commits to a tone and uses that tonality to find its way into a conflict far removed from the playwright’s own experience. Of Ruin struggles to strike a similar balance, while attempting to take on a much larger story. Directed by Johanna McKeon, Of Ruin is a rumination on destruction, the fragility of memory itself, and the impossibility of reconstruction once memory fades. 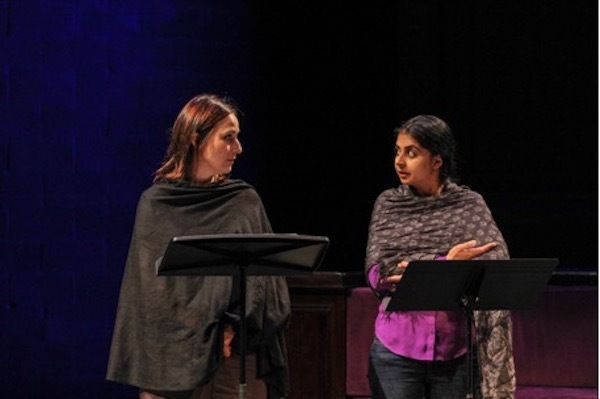 Three characters (named A, B, and C, in another Becketteseque turn, and performed by Pooya Mohseni, Maha Chehlaoui, and Sevan Greene, respectively) embody three memories. Standing amid the foundations of demolished buildings, they take survey of the ruins around them, struggling to reclaim a sense of place, and the voices, bodies, and birdsong that once inhabited it. Throughout the performance they blow flour on each other to signify dust, they walk in circles, move in careful rituals of high content, all features of performance that by necessity cannot be performed in reading. But even in reading, mood and tone are collapsed, and the piece dwells too deeply in abstraction while signaling where it wants the audience to focus attention. A offers the following summation at the end of the piece, “Sana’a 2019. Paris 2022. London 2032. New York City 2021. You don’t believe me. That’s okay, I didn’t believe either.” It’s a heavy-handed appeal to a hypothetical future, though one worth bearing in mind as the evening’s performances continue. The conflict enters those uneasy spaces of Western privilege in Karen Malpede’s Dinner During Yemen, directed by Markus Potter, Kia Corthron’s Charade, directed by Kevin Hourigan, and Naomi Wallace’s The Book of Mima, also directed by Kevin Hourigan. Dinner opens with an offstage scream, interrupting the banter of two deipnosophists, Nita (Kathleen Chalfant) and Rita (Dee Pelletier.) Between kumamoto oysters and glasses of Bordeaux, Nita and Rita airlessly cover every corner of the conflict, treated here as an unruly neighbor screaming next door, whose problems they can only diagnose from afar. Like Push/Pull, much of the dialogue here is informational, albeit anchored in a very specific relationship to power and state violence. (“Times recipe. It’s a proxy war,” Rita offers while serving up forkfuls of braised seabass.) Here, the conflict has been reduced to a series of small anecdotes delivered from a comfortable remove, from which it can be rationalized as part of the natural order of things, in which everyone and no one is to be blamed. “Civilization is but a veneer,” Nita proclaims, while trying to determine whether the screams outside are from a trapped animal or a starving child. One imagines Charade taking place across the East River, or perhaps Uptown, from Dinner During Yemen, among a group of millennials (Baize Buzan, Erron Crawford, Juliana Canfield, Sevan Greene, and Sherri Eldin) playing a game of Taboo. When Yemen comes up as a guess word and no knows the answer, the guitars come out and a sing-along commences. The musical number that follows, “Yemen! Yemen! Yemen!” occupies an almost unnerving border space between trite and trenchant, between Python and Brecht. But what keeps it from devolving into glib, millennial trivialization of the conflict is the very fact of the conflict itself, laid out verse by verse as a series of choices made by one great power after another, whether Ottoman or Saudi, Iranian or American. Here information doesn’t burden the play, so much as liberate it into the space of high absurdity, which might be the only register to understand the full historical sweep of a conflict seemingly without reason, and with outcomes almost unimaginable on the human scale. Sevan Greene and Baize Buzan in Charade. Photo: New York Rep. But even absurdity has its limits, and ultimately the performers in Charade, whatever their privilege, cannot rhapsodize their way around death and destruction. In this very critical sense, they are not very far removed from the protagonist of the evening’s final performance, The Book of Mima. The Book of Mima is a monologue, not of the titular character, a Yemeni schoolgirl reading a book outside the front door of her house, but of the U.S. laser-guided missile that will ultimately destroy her (James Udom). “The Flyer,” as the missile is known, takes careful, almost loving, survey of the landscape over which he travels, “[T]he place Herodotus mapped in his mind, that Pliny and Strabo praised . . . cities that seem baked not built, of iced gingerbread.” He knows Mima, knows her family and the village in which she resides. As he turns and turns above her, he goes over the etymology of Mima’s name, the names of her brothers, the precise words in the book she is reading. James Udom in The Book of Mima. Photo: New York Rep. The Flyer believes himself a hummingbird, an ethereal creature born of love, lyrically avoiding the very murderous nature of his true purpose. But as he inches closer and closer to the detonation sequence, his thoughts become more frenetic, more self-abnegating, alternating between chest-thumping bravado, John Mellencamp lyrics, and a final realization of what he’s been brought here to do. “Have I always known this?” he says, “That I was not made to fly?” His final appeal, “Somebody please stop me,” is less to American innocence than the depleted American moral imagination: a call to action in a time of omnipresent state violence enacted with the full faith and credit of the U.S. government. Ultimately, the evening’s most powerful performance is the one that makes the fewest claims about the conflict. Younis Ali’s Waiting for Naeem, directed by Shadi Ghaheri, is the only submission of the nine written by a Yemeni playwright, and brings to the stage a simple, bracing, urgency, about the very brutal particulars of life during famine. Another pair of women waits in the dark, here a mother and daughter: Dolah (Valerie David), and Rehma (Bahar Beihaghi). At the edge of starvation, they wait not for the lights to come back or the bombing to end, but for the return of their son and brother, Naeem, who has gone missing. Naeem’s return is less a hoped-for outcome, a salve for all their current afflictions, than a hedge against the unthinkable. Dolah, unable to bear watching her two youngest children starve to death, wants to end their lives herself, while Rehma begs her to simply hold off for another night. Their conversation is a delicate, and ultimately futile, dance around the last disintegrating pillars of memory, resistance, and hope that comprise a human being’s basic will to survive. The piece doesn’t end so much as it collapses in a torrent of desperation and grief, the end of humanity itself, of being human. This is less a statement on the meaning of conflict for those marked by it, than on how conflict reduces even the most pious and faithful among us to caged animals awaiting the abattoir. 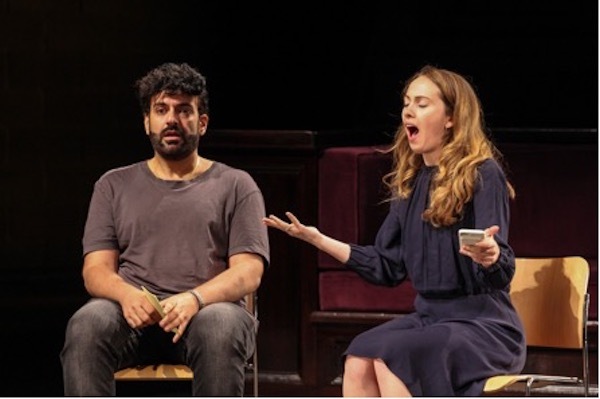 But as much as Waiting for Naeem brings a desperate, first-hand authoritativeness to the stage, it also calls attention to the lack of other Yemeni voices currently onstage. Yemen is not without a theatre, or a theatre in translation, and however limited it may seem compared to other Arab countries, its theatre, like that of Egypt, Syria, Lebanon, and Palestine, is very much in dialogue with the Western Canon. Works like Waiting for Naeem only underscore how impoverished our current understanding of this dialogue is, and the very real and critical need to elevate more voices from within the culture, while there’s still a culture to write about. 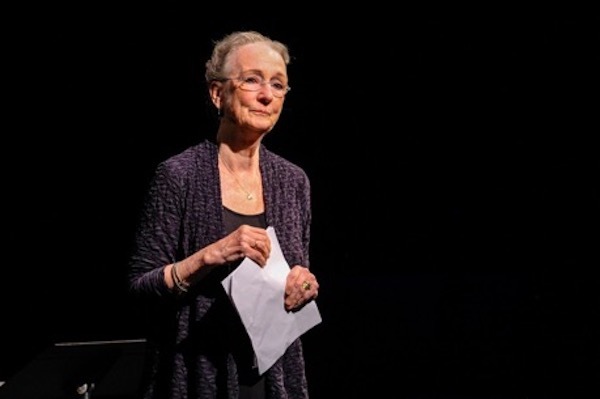 Kathleen Chalfant delivering a fundraising appeal for Doctors Without Borders. Photo: New York Rep.
Hani Omar Khalil is an attorney, writer, and photographer based in Brooklyn. 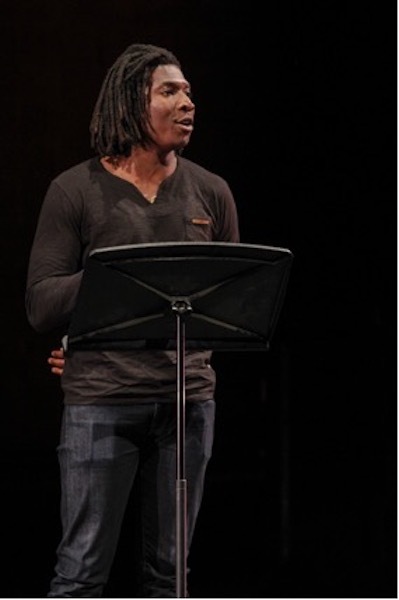 His short fiction and critical essays have appeared in Anomaly, CultureBot, Baraza, Muftah, Corium, and Epiphany. He received his BA from the University of Wisconsin-Madison and his JD from Rutgers University.